Evie's decided that she wants a normal life, complete with a boyfriend, high school, a job, and a locker. This all changes when IPCA contacts her to come back as a contract employee. I really enjoyed learning more about Evie, Lend, Ariana, and all the new creatures that appear in the book. 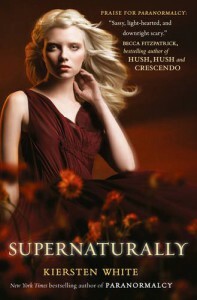 White's unique spin on the different paranormal myths really makes this series unique from the other young adult paranormal series out there.